Wake up, people! It’s November and we’ve already snoozed for an extra hour and we’re about to pick a president. We’ve recovered from our Halloween candy hangovers and we’re ready to talk turkey. There’s frost on the ground and I’m busting out my winter collection of scarves and mittens. The times they are a-changin’. I wish I could tell you a heartwarming story about how every year, I get together with a bunch of family and friends and we all gather in the kitchen and bake Christmas cookies and swap stories over peppermint mochas while “Jingle Bells” hums softly in the background… but that’s rarely the case. Usually it comes down to two scenarios: 1) I have an undeniable hankering for Christmas cookies, so I bake up a batch for myself, have one or two, put the rest in the freezer so as to force myself to save the rest for Santa… and then somehow they all magically disappear before Christmas Eve (This happens to a lot of cookies in my house. Mysteries.) or 2) My mom/friend/neighbor and I decide we need to start a new tradition of baking Christmas cookies every year, we bake a bunch of them and give them away and everyone’s happy and we say, “Let’s do this again next year!” and it inevitably goes by the wayside, as many ingenious ideas do. 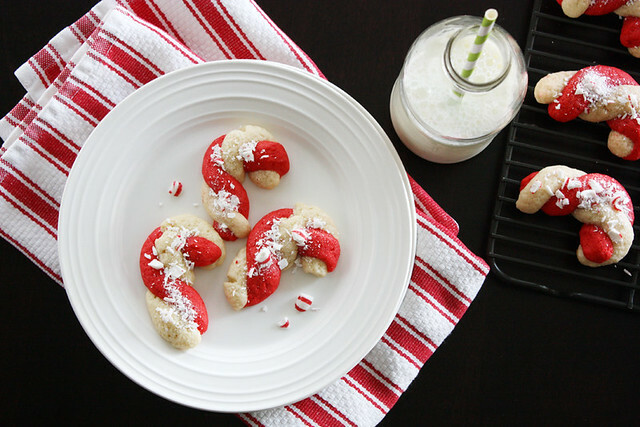 Whatever the scenario from year to year, though, these candy cane cookies always seem to make it into my kitchen during the holidays. They’re just too dang good. Something about the combination of sweet vanilla and cool peppermint in a warm fresh-baked cookie that looks like a candy cane pervades my mind and tugs at my heartstrings and I am forced to make a whole batch (or five) for the sake of Christmas cheer. It’s a tough job, but someone has to do it. Luckily, they couldn’t be easier to make and Reynolds parchment paper helps me get the job done without a single hitch. Well, except that part where they never seem to make it to Christmas. I’ve got to look into that. The how-to is pretty simple: 1) Make a bunch of cookie dough. 2) Chill the dough. 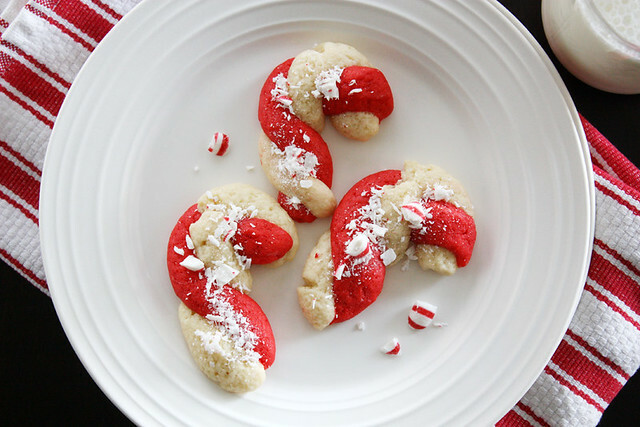 3) Shape the dough into candy canes. 4) Bake the cookies. 5) Stuff into your candy cane cookie hole. 6) Taste the Christmas cheer. 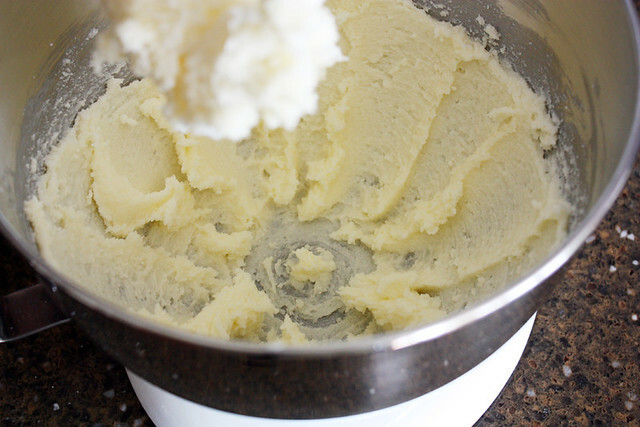 In a large bowl or bowl of a stand mixer, cream together sugar and butter until smooth. Add milk, vanilla, peppermint extract and egg and stir to combine. Add flour, baking powder and salt and stir to combine. Divide dough in half. Shape one half into a ball and cover with plastic wrap. Place in refrigerator. 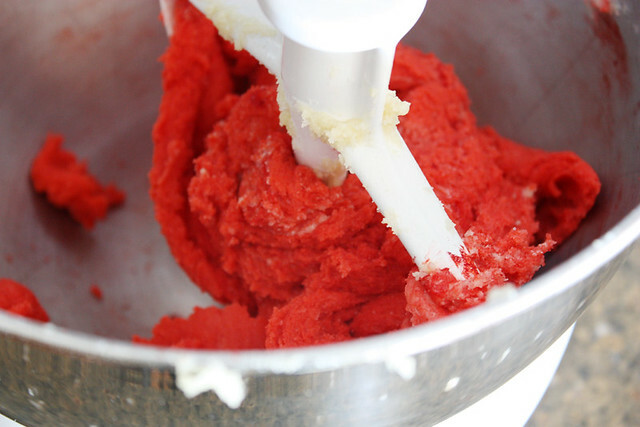 Place remaining half of dough in stand mixer and add red food coloring; stir until food coloring is fully incorporated. Shape dough into a ball and cover with plastic wrap. Place in refrigerator. Chill dough at least 4 hours. Preheat oven to 375 degrees F. Line baking sheets with Reynolds parchment paper. Remove dough from fridge. Take one rounded teaspoonful from each piece of dough and roll into 4 to 5-inch logs. 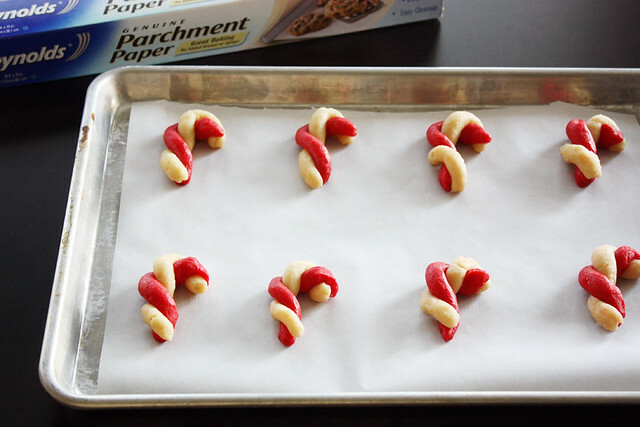 Twist logs together into a candy cane shape and place on baking sheets about 2 inches apart. Repeat with remaining dough. 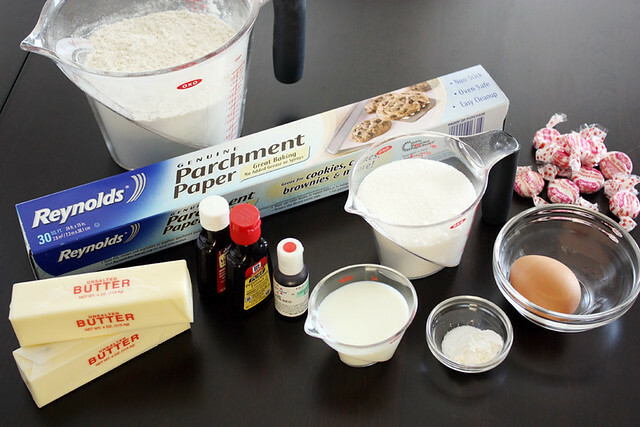 Bake cookies 10-12 minutes or until just set. 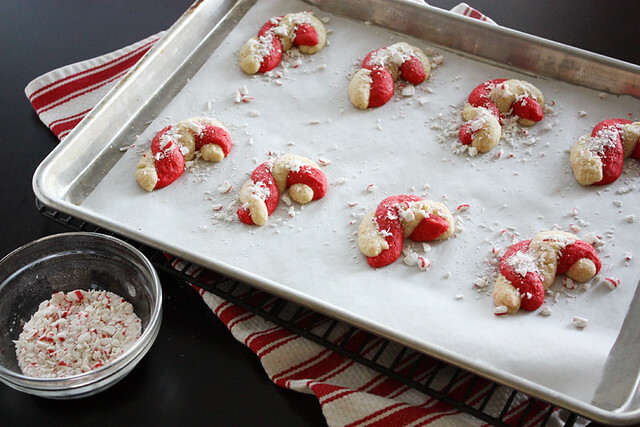 Remove from oven and sprinkle immediately with crushed peppermint candies. Transfer to cooling rack to cool completely. Disclosure: I received compensation from Reynolds for recipe development purposes. All opinions are my own. Yay! These are too cute to resist, and I know my 5-year old will dig em. Thanks for being awesome. Valerie — No no, thank YOU. 🙂 Hope you and your family like them! Kate — Thanks so much for the comment and for letting me know about the pinning problem! It’s been a bug on my site for a while now and I’m looking into it. For now, if you want to pin it, you can repin from me: http://pinterest.com/pin/280138039292713460/. Stop it right now! I just made similiar cookies yesterday!!! There for a project I’m working on…Love your version! This was absolutely perfect and not too unhealthy either. Thanks for the recipe. Shivani — Glad you liked it! Hope you have a wonderful Turkey Day! Nicole — Mmm, can I come over to your place for Thanksgiving? 🙂 Thanks for the comment! I don’t even celebrate Xmas and I can’t wait for Xmas cookies too! These are so adorable and cute! Adding htem to my holiday baking list! Wow! I have never seen anyone else make these cookies! These are a family tradition for the last 4 generations in our family. It warms my heart to see that the recipe (though slightly different) isn’t lost. Thanks for making my day. Anthea — I love that! They are a tradition in our family now, too. 🙂 Thanks for sharing!